In 2006, she graduated from Dalhousie University with a Bachelor of Science in Kinesiology. During her time at Dalhousie, she was an athletic trainer with the Dalhousie varsity swim team which kindled her interests in the fields of sport injury rehabilitation and myofascial work. After travelling abroad for a year, her mind was set. Her passion for helping others, along with her sports interests and love of anatomy and biomechanics drove her to pursue her Doctor of Chiropractic degree. In 2011, she graduated from the Canadian Memorial Chiropractic College in Toronto and soon after, moved back to Halifax to establish her practice. Over the years, she has gained experiences in a variety of locations working in partnership with multidisciplinary teams. Her personal goal has always been to achieve and maintain the best possible health; this same goal for her patients. As an advocate of both wellness care and injury prevention, she uses a diversified chiropractic approach, which includes a focus on the spine and extremities as well as the implementation of myofacial release. She is certified in the use of Graston, cupping and Kinesiotape techniques to support muscular, postural and joint injuries. Sasha is a member of the Nova Scotia Chiropractic Association. 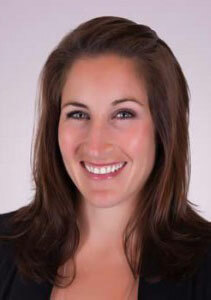 She has acted as the team chiropractor for a Junior level hockey team and is an avid volunteer. Away from the office, she is a dedicated mother, runner and yogi. She can often be found hiking the trails of Maskwa with her dog Maverick, family and friends.